Pendant toutes ces années, je la jaugeais familière, elle m'apparaissait aliénée. Instagram, Path, Twitter, Facebook, Flickr et j'en passe — j'étale autant que possible mon ombre numérique ailleurs, et la reconstruis ici, à mon gré, en mes termes. Et si je reprenais tous ces instants maintenant bien loin de leur contexte, et rembobinais leur histoire? Et si je réinventais cette année 2011? Secouer la boîte aux images, et les laisser raconter. Un an dans cette nouvelle ville. Une rétrospective ivre, floue et pleine de grain de ces douze mois entre un sourire au “mind the gap” sur le quai du train me menant d'Heathrow en ville, et une pensée de passage: je vis dans ma troisième (ou quatrième, c'est selon) capabilitiese mondiale. Formidable. Une ville réellement magnifique, jouant sans honte des clichés; mélangeant le moderne (le Guggenheim de Gehry) et l'ancien (très 19ème siècle, aussi bien les bâtiments que le plan de la ville). Et peut-être le seul endroit en Espagne ou l'on peut avoir du mal à trouver un coin où manger un samedi soir à 21 heures. Novembre 2011. San Francisco, dérive entre la Mission, Castro et Downtown. Là où le glauque n'est jamais bien loin du joyeux. Notes from the Silicon Valley car culture. One day, perhaps, Web historians will be arguing vehemently about the term “web site” (circa end of 20th Century, origin unknown). I am afraid my site and its history – if any trace remains, will puzzle them a fair bit. Il y a dans notre jardin un papillon qui bat des ailes; C'est si beau, si fascinant que l'on en oublierait tous ces ouragans lointains. Innovation means testing a lot of ideas and methods, and unless you are obscenely lucky – failing a lot. The key is to learn, and fail (or succeed) fast. One thing I learned recently through an exercise in rapid, user-driven prototyping workshop: a little suspension of disbelief can help innovation go faster. Having finally had a chance to unpack some of my books from the cardboarded existence I’ve had to impose on them in the past few months, I have had a chance to do a bit of reading, recently. 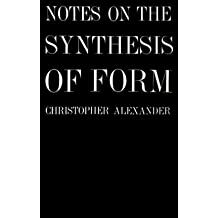 One of the books I’m almost through is Christopher Alexander’s “Notes on the Synthesis of Form”. An early work of the theorist of architecture and father of “pattern languages” (I seem to recall it was his doctoral thesis), “Notes” is often touted as Maths-meet-Architecture, for its focus on graph theory, systems, subsystems and their dependencies. A year or so ago, I was invited by the executives at the company where I worked to participate in a series of soul-searching business strategy meetings. At some point in the second or third session, I dropped a bomb. The core problem of interactive agencies, and indeed of the whole agency model, I argued, was that the work being produced was simply mediocre. Last month, I was in the happy few attending the first London installment of the "Systems/Layers Walkshop" organised by Adam and Nurri of Do Projects. He's hunched on the counter, coddling his drink, taking short sips between jokes, pouring his heart out. On the other side, the owner nods between orders and on occasion whips out a witty reply to his guest. First visit at the British Museum: an example of both the best and the worst of exhibition design. It starts with smell. The smell of rain. The dry smell of rain, as the first drops hit the stone pavement. When you enter the immense hall of the tate modern, this smell the first thing that will hit you, followed shortly by the sound of ghosts raking the field of Ai Weiwei's sunflower seeds as monks would a zen garden full of small pebbles. Ten centimeters deep, and the surface of a couple basketball fields. It's hard to fall in love when the heart's already taken. I was decided to give London a fair chance. Surely, the costly and exhausting move in the middle of winter, when my typical working day would hardly let me see the light of day and only let me see the new city through a veil of night and rain, surely all this would be handicap enough without me making it even harder.